I love the fake mother demanding gun control. Got it, another false flag event done to push the gun control agenda. At first glance I thought she was Michael Moore in drag. Make that plea to the people of Chiraq. Could this … possibly be … the esteemed Christine Leinonen of the Pulse? This was not a false flag. That is a pieced together video which is not real. My friend is a cop and his daughter was hiding in the bathroom for an hour before SWAT got her out! I was just there today and you can see all the broken windows with boards over them. A distraction to other crap going down, yes. This event DID happen! Looking at CNN’s ‘horrifying’ video, it doesn’t look like there were many line-dancers that night. 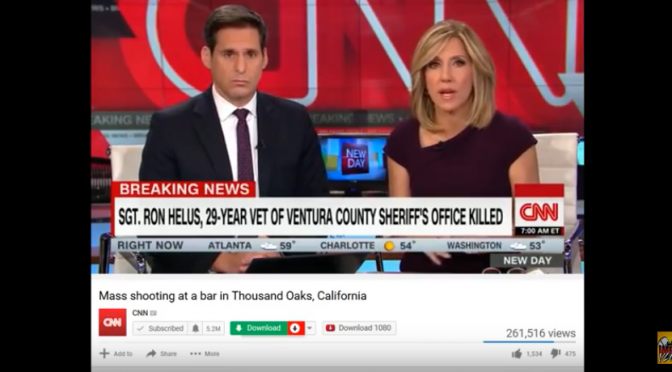 It could be that whatever patrons there were in the bar were treated to a surprise drama put on by crisis actors and others. With sound and visuals, it wouldn’t be hard to convince people that an incident was occurring, especially country-western-oriented people primed by the Event in Las Vegas. If there were actually people there, that is. It would be interesting to hear your friend’s daughter’s story. And I tried to get him to come back and engage. This one’s got it all. I do not think a .45-caliber handgun is an “automatic weapon” but what do I know. Was wondering if Phillip Mudd is related to Roger Mudd. There’s a lot of nepotism in the deep state, especially for on-air personalities in network TV. There were other videos in which, at points, purported survivors were almost smiling when giving the details. The scene inside the Borderline was filmed by Dallas Knapp a.k.a. “Mr.Knapp@Instagram” who is a model/actor who resembles David Hogg. Watch CNN to figure out the enemies agenda. .
Did anyone see this? The shooter was supposedly posting to instagram during the shooting. There is an interesting TED talk by Jane McGonigal about “Alternate Reality Games”. These are fantasy games that involve hundreds or thousands of people, and extend beyond the computer screen into real life. She and others believe these “games” are a way to bring meaning and community to the players, while promoting socially goals.